Designed as a means of raising finance for new office space for the Hong Kong Film Director’s Guild (hence the long list of celebrity cameos), Twin Dragons isn’t half as knowing or self-indulgent as you might think. 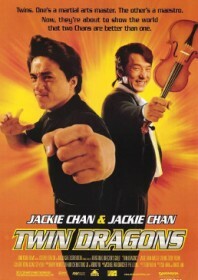 It’s actually a firm, enjoyable Jackie Chan caper with Hong Kong’s biggest action star playing identical twins separated at birth in shades of Van Damme’s Double Impact, which was released the year before. One is raised on the tough streets of Hong Kong to become a car mechanic and part time illegal racer, the other is raised by his biological parents in the US to become a world famous concert pianist. Inevitably their two polarising worlds collide, as they swap girlfriends and get into all manner of hi-jinks with some nasty criminals. As silly as it may be, it’s certainly never dull. The final showdown pits two Chans against a hoard of tough guys in a car workshop, with the martial arts legend leaping in and out of automobiles and dodging speedy cars in some of his finest and most daring feats.